“A city isn’t complete if it hasn’t its hammam”. With these words, the beautiful Sherazade enchanted the Indian king in “One thousand and one night”. The Hammam ritual mixes beauty and wellness: a hygienic, aesthetic and social usage that comes from long ago but is still actual nowadays. A deep feeling of the body, which is completely relaxed and regenerated and gets in touch again with the soul. If you want to give yourself a pure wellness treatment, Hammam is what you need. This ritual has so many beneficial qualities to be considered as an essential habit which allows to stop and take care of yourself, purifying body and mind. It consists of 5 steps: the Turkish bath warms the skin and opens its pores to let the body start a relaxing path, helping the mind flow and leaving thoughts apart. The Savonage, the cleaning step, is done massaging on the skin a black soap till the typical foam comes out. During the Gommage, the exfoliating step, a rough glove called Kessa is used on the skin. This glove is perfect to free the skin from dead cells, oxygenating it and reinforcing the immunity defences thank to the antioxidant action of the black soap. During the nourishment step, skin is enfolded in a clay wrap (Rhassoul) for a deep hydration, becoming softer, brighter and elastic. The perfume is the last step of the Hammam ritual. In this step, body and mind are freed from tensions through a strong massage done using warm and scented oils which are suitable to take the customer to a complete relaxed status. According to the heady sensations of the Moroccan purifying ritual, ISO Benessere revises the Hammam in a modern way presenting Lympha. 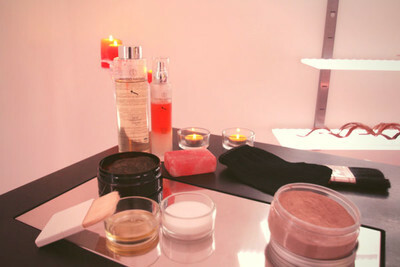 Lympha is more than a normal table for Hammam. It is the reinterpretation of göbektaşi, the typical marble slab, in an innovating way keeping the cultural origins of wellness. It repeats the ancient ritual concept but considering the needs of the modern society. 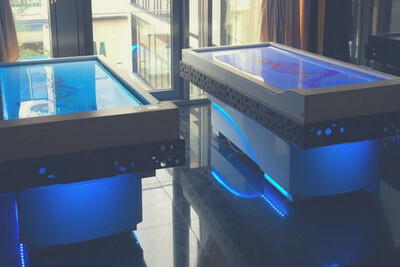 In Lympha the marble slab is replaced by a plexiglass surface which is heatable, backlit and has a customizable graphic. The fascinating blade of water that comes from the top of the bed can be alternative cold and hot water and completes the massage, leaving the feeling of a caress on the body. A wonderful challenge which open doors to an unexplored world where culture and wellness interact in the way of success. Lympha is easy to clean: a thermoregulated shower is provided and it is useful to rinse its surface and the customer. 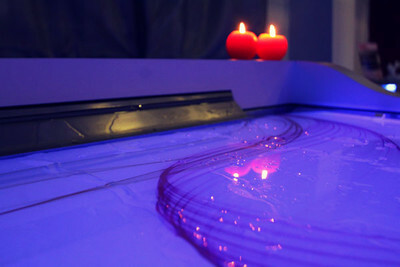 In addition to its practical and functional skills, Lympha is able to enhance light and colours, together with music and aromatherapy, to make them the basic elements of the treatment. All these features bring the customer’s senses to an experience of deep well-being. Lympha is an essential equipment which increases the income of the wet area in a SPA, known as the most expensive area for those who invest in wellness.